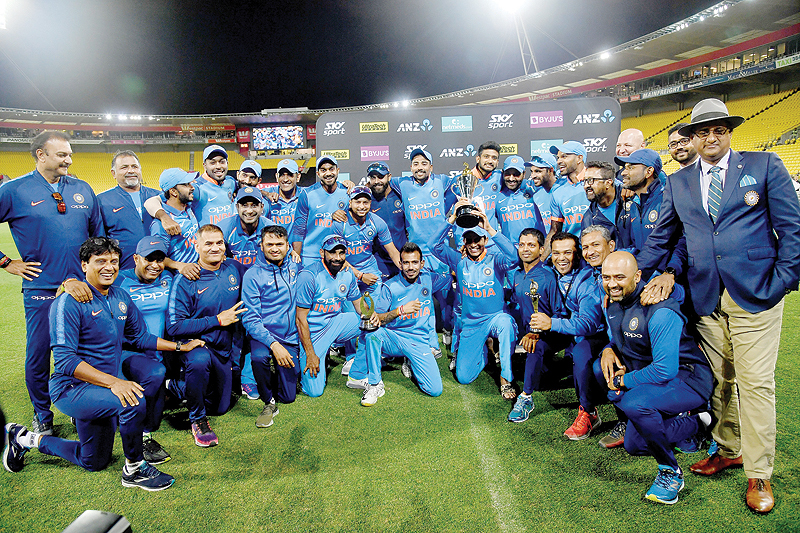 WELLINGTON: A commanding knock of 90 by Ambati Rayudu rescued India from deep trouble and saw them beat New Zealand by 35 runs in the fifth one-day international in Wellington yesterday to wrap up the series 4-1. Captain Rohit Sharma admitted he took a gamble-and Rayudu made sure it paid off-when he opted to bat first instead of playing to India’s run-chasing strength. They made a disastrous start and were four for 18 before Rayudu, with help from Vijay Shankar, steered the side to 252 and New Zealand in reply were all out for 217. India went into the match with an unbeatable 3-1 lead in the series and looking to atone for their sole loss, an eight-wicket defeat in the previous match. “If the series was on the line I would have batted second, it’s our strength to chase but we wanted to test ourselves, how we bat,” Sharma said. “We required guys to show character and they came out and showed a lot of character today.” Four months out from the World Cup the series highlighted the gulf between second-ranked India and third-ranked New Zealand. But when the swing bowlers were taken out of the equation, Rayudu and Shankar toyed with the attack, putting on 98 for the fifth wicket before Shankar was run out at 45. Rayudu, who faced 84 deliveries to reach 44, needed only 27 more for his remaining 46 runs in an innings that included eight fours and four sixes. He had a life on 60 when dropped by Boult and was eventually removed when Henry, New Zealand’s most successful bowler, came back for his second spell. New Zealand batted through to the 45th over, which captain Kane Williamson described as “a step in the right direction” after being comprehensively beaten in the first three games of the series. Like India, New Zealand’s top order also went cheaply, before a 67-run stand by Williamson (39) and Tom Latham (37) for the fourth wicket. But after they went in quick succession Yuzvendra Chahal led a spin assault that saw the hosts all out for 217, with Chahal taking three lbw decisions for 41. James Neesham threatened to get New Zealand up to their target when he whacked 44 off 32 deliveries before inexplicably running himself out. When India fruitlessly appealed for a leg before decision, Neesham stepped out of his crease in search of a possible leg bye, unaware the ball had been picked up by wicketkeeper MS Dhoni who had an easy shot at the stumps.